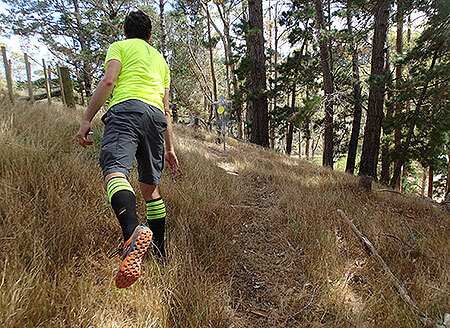 The 2014 Waitawa Disc Golf Championships. 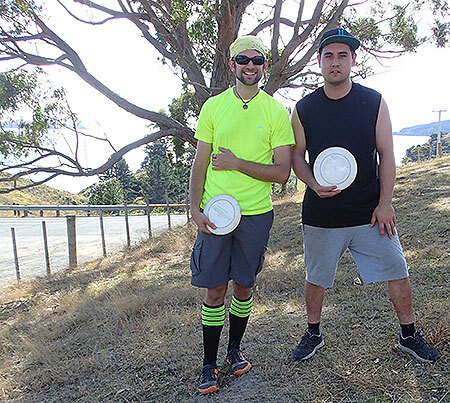 Auckland's all new Waitawa Disc Golf Course was all of 2 weeks old when players from around the country ascended on this east Auckland Regional Park for the inaugural Waitawa Disc Golf Championships. 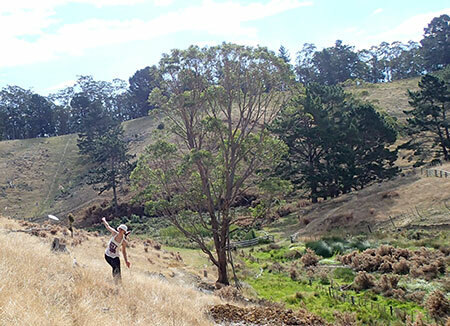 The virgin nature of this course has organisers in somewhat of a panic trying to make the course acceptable to the high standards that the New Zealand Disc Golf Tour has become accustomed to. Whilst the 20 baskets had been installed over January and February, other aspects of the course were still in the making as focus fell upon the important jobs of making the park itself ready for the droves of public checking it out. And in their droves they came. Not to the disc golf course but to the beach at the other end of the park. Meanwhile birds chirped and the air rang with regular 'kaching' sounds as a growing group of keen golfers readied themselves for the competition in the morning sunshine. TD Gabb was somewhat thankful he had a player count of under twenty, meaning he could group them closely so they could help each other with spotting and course familiarisationalism. Some local Auckland players had been putting in many hours work to compliment the fine work by Regional Parks staff & contractors developing this first-ever for the city and course designer Simon Feasey had looked to create a tough course on some tough terrain - he had joked earlier that there would be tears and TD Gabb agreed. However, the strong winds that golfing helpers had become accustomed to during their many visits to the park stayed away - not just for the first round but for all three rounds of regular play! Auckland golfer Dave 'Speedo' Keene could see that the chance of a long lasting course record was certainly on the cards. Sadly a chest infection had laid tournament and course record favourite Feasey out for the day, meaning the favourite tag was hovering over a few likely lads and lasses. By the end of the day it was indeed Speedo who had his name next to that record score with a magnificent eight under 51 on his way to a convincing lead after 2 rounds. 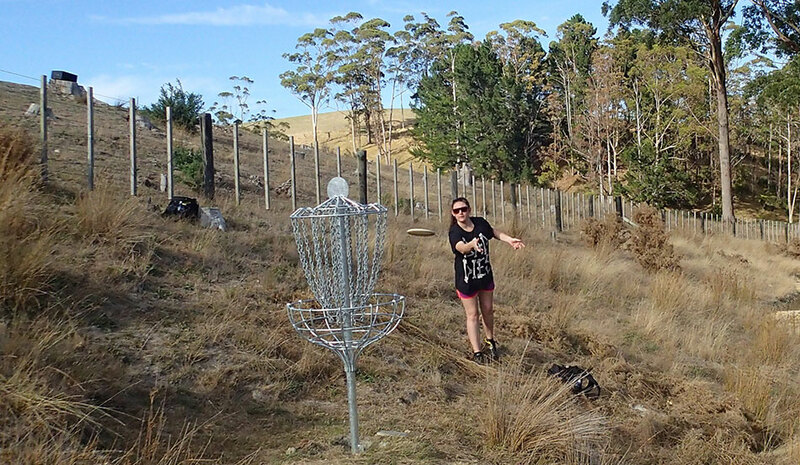 Feasey ensured that hole types are quite variable on the Waitawa Disc Golf Course. Like the mountain bike trails that weave their way around the park, there are plenty of climbs and drops. There are left curving holes and right curving holes, long and not-so-long (note the non use of the word 'short'!). Golfers who stayed at the park were treated to spectacular sunsets and sunrises from the house they were allowed to use thanks to Regional Parks. As the sun rose into the sky Sunday morning, it looked like the luck was continuing. A beautiful autumn Auckland morning greeted players as they converged at the disc golf clubrooms (a big old shed) and you could see they were keen to get out there to enjoy the nice cool conditions. The light on the hills were a stunning sight with colours that you only see early in the morning as groups started on their final round before the Super Six. Once again players were joined by on-park Ranger Stan who - as a ball golfer - had a good understanding of the challenges players were facing on their quest for a Personal Best. 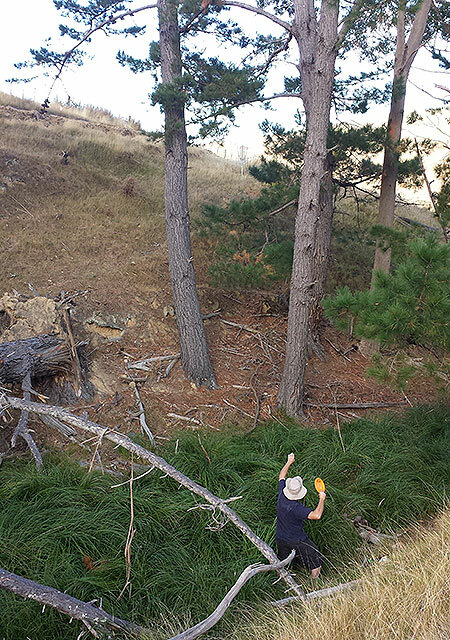 Ranger Stan also got his first real sense of the game and course layout, noting many of the things he and his crew of helpers would need to tick of in the coming months to make the Waitawa Disc Golf Course the excellent facility it promises to be. By lunchtime the scores were in. We had a few new PBs coming through (Lawton Williams, Des Cooper, Mike Proctor, Andy George, Woody and Paula Wilson) including second place Jacko firing a fine 55 halving the gap between he and first place Speedo Keene. Another highlight was Gemma shooting her second sub-60 with a par 59 to make her first appearance in a Super Six - awesome! The Super Six players and gallery were in for yet another treat: course designer Simon Feasey had arrived to take it all in and was invited by TD Gabb to make up the holes for the S6. Naturally Feasey wanted to see his 'Chamionship' holes in action and so they started with the massive par 5 first, using tee 1 to basket 2. The challenge proved itself with just 2 of the players achieving par. The second was to a basket dedicated for the Championship course then back to the traditional third basket. By this stage time was running out for regular Super Sixer Pete Boyle as he raced off to make it to his community effort back home. Spectators were still given a great display of disc golf including another big one: the final hole used tee 10 but players had to make it all the way across to the 18th basket! 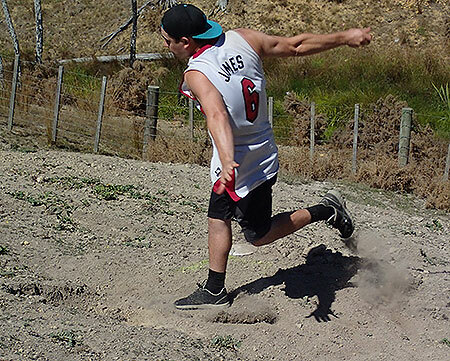 With a lead of 4 strokes, Keene had just needed to avoid disasters to be the inaugural Waitawa Disc Golf Champion. And that he did. Brady Kuech managed to jump a few spots in the Super Six. Gemma was of course assured the Womens title with another great 2 days of golf under her belt. With the wind staying away it was no surprise that good scores were achieved. Whilst the terrain made for a true test of stamina, the calm conditions meant that player only had themselves to blame for the need to climb big hills to retrieve their discs (or unlucky rollers thanks to last minute smooth greens - thanks Gabb!). After the tournament players were praising the course for the test it gave them and organisers were very pleased that they could all appreciate that the course is going to get much better as work continued to clean up fairways, provide fence styles, signage and more. You can bet that Waitawa 2015 will be even better (weather dependent)! So we now have a bunch of PBs that may well stand for some time. And a course record of 51 by Waitawa Champion Dave Keene for the main 'Club' Course - can you better that? 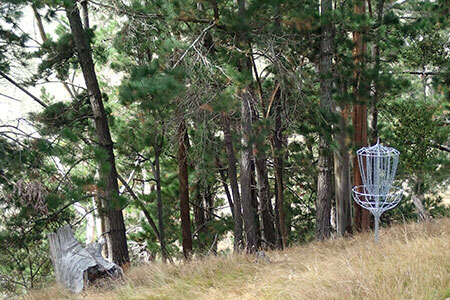 If you do, please tell us about it (or any of your expeditions to the Waitawa Disc Golf Course) via our contact page. Gabb would like to thank those that attended and also those involved in developing the course. 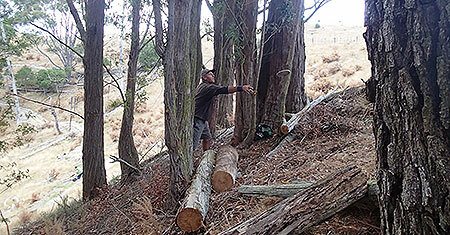 It will develop into a world class disc golf course so keep an eye on our Waitawa Disc Golf Course page for updates. 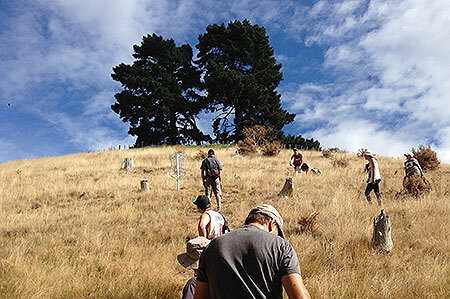 Click to see pages for past Waitawa Disc Golf Champs: ha, there have been no past Waitawa Disc Golf Champs! 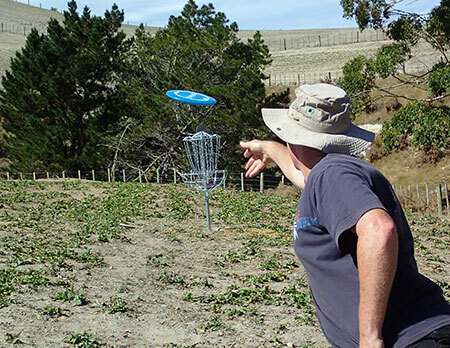 Sticking it to em - After enjoying a dip in the Hauraki Gulf, veteran golfer Pete Boyle relates a story of his first ever round of disc golf where the only thing he managed to beat was a stick. Popular Park - Whilst thousands (yes 1000's) flocked to the beach at the new Waitawa Regional Park, the only crowds you saw on the golf course were players sharing in the usual encouraging banter (where were you Cohen? - ed.) and focusing on their rounds. Nice Birdie - Tour contender Brady Kuech needed a ballsy putt to ensure a 2 on hole 16. Considering the nasty backdrop, this was one to write home about. Dear Mom - This is the sight that greeted me as I decided to go for the birdie. If I missed I was staring at a quadruple double bogie. But Mom, guess what? I GOT IT!. 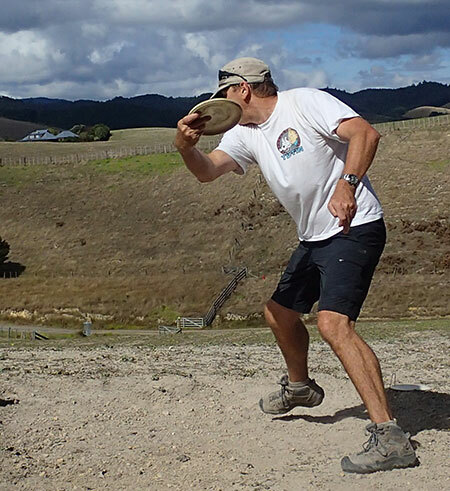 A Cracking Woody - One of the locals to give Waitawa a go was Keith 'Woody' Inwood, a great character of Auckland disc golf. He was showing he hadn't lost it either, with one shot improvements all the way (68, 67, 66). Based on that, play 16 more rounds Woody and you'll have the course record! Hilly Billy - Hole 3 was quite a challenge. Here Paula Wilson returns to the green as part of a tough recover having faded her disc down to the MTB track at the bottom of the hill. Hard Man - The field did not even recognise that Mexican golfer Juan Unda was playing with a broken finger! Despite the intense pain and a need to adjust his grip, Unda battled through keeping his scores sub-70 and even fired a few decent left handed throws in the 18th! More Fingers - Camera-shy golfer Nigel Hailstone even managed a message for cameraman Len Skap as he curved his disc for a nice birdie on the 14th. Comeback - It was great to see AB Hartley (Levin) return after a short hiatus from The Tour. Consistent golf came from this athlete with 64, 63, 63. But he would be the first to tell you he can do much better than that! Chique Technique - Ever improving golfer Paula Wilson (Palmerston North) show great technique on the putt. And the results were there with many fine slams into the chains, making the most of the calm conditions. And the Steve Price bucket hat was a great addition. Highlight of the Day - One of the great things about the New Zealand Tour is that like minded people get together for a fun competitive weekend. Here on the 7th tee are Brady Kuech (Wellington) and AB Hartley (Levin) who 'disc'overed they were about to use the same disc!. 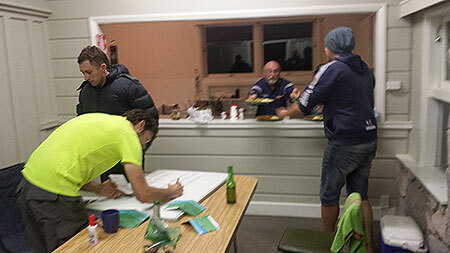 Keeping Score - one of the tasks performed by the overnight crew was to collate the Saturday results into a scoresheet. Brady the Human Calculator was a natural for this tasks whilst Pete "Jamie Olivergo" Boyle produced a fine feed for some hungry golfers. 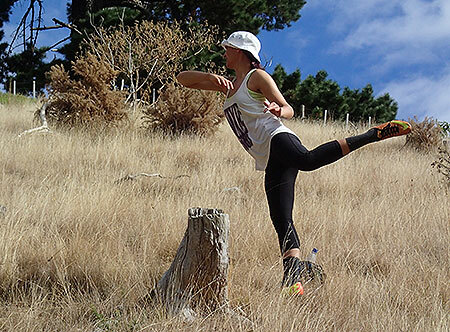 Strong Joynt - That Tokoroa supergal Jenny Joynt turned up at the Waitawa Disc Golf Championships was of no surprise to many. Jenny has attended the most Tour events of anyone in the last 5 years and we can see that she continues to improve because of it. Here this senior athlete drives past the basket on hole 9 giving herself an up-putt for birdie. Morning Delight - Sunday morning started much like Saturday - calm, sunny with a bunch of keen golfer ready to test themselves against a premium course. Chillin - Players enjoyed lunch in front of the house that they were allowed to use for the weekend thanks to Regional Parks. To see the view they had, click here (image, opens in new window/tab). Powerhouse Jackson - Levin's top golfer Jackson 'Jacko' Sullivan has mastered the big accurate drive, here releasing a fiery backhand on hole 3. This tee was a lot of work to build, even with a digger, as it was cut out of a very steep slope. It is also large as it doubles as the tee for the Championship course's second hole (you can just see the basket for it top of picture above Jacko's hand). Rolling Hills, Rolling Disc - Hole eight's tee is on open land. And the fairway is nice and open, maybe too open for some when the wind is blowing! Here Jacko makes the most of his power in an attempt at a birdie 3. Dog Leg - If the wind were blowing, we would have to bet on some golfers heading off for a long walk either side of the eighth fairway to attempt a tough recovery. The lack of wind saw almost all players stay well within the fairway. Tee Off - Another view of the eighth, this looking back at the tee from near the green as Juan Unda (Mexico) drives. Disc Diva - Gemma Sullivan (Levin) made the most of the 16 'B' tees to fire some awesome golf and make it into the Super Six for the first time. Well done! Group on Top - Watched on by fellow competitors veteran champion Pete Boyle fires his trademark sidearm on the Championship course's second hole.